John Steinbeck, was born on this date in Salinas, California (1902). He is the author of many books including the epic novel The Grapes of Wrath (1939) and also Of Mice and Men (1937). The book of his that had the greatest impact on me was his Travels with Charlie, the story of the trip started September 1960, by Steinbeck and his dog, Charley, a trip across America. It was the first serious book I can remember reading, I took the paperback with with us on a family trip to Disneyland where we celebrated my brother Randy's birthday. The next time I was in the Disneyland Hotel was about 6 years later with my now ex-wife Janet on our honeymoon. She was sick and wanted to go home early. I've often thought of writing Travels with Janet. People sometimes ask me why I don't write up what the speakers share with us at the Denver IDEA Cafe. We meet each Friday and over the last 15+ years we have had some excellent speakers, ranging from Lloyd Lewan to Joe Blake, from Sam Newton to Bonnie Kaake. The group started as a way to promote the radio and TV shows I took from station to station in the early 90s, I suppose as part of my misguided efforts to recover from my divorce from Janet. I modestly called the radio/TV show John Wren's Journal. I still have tapes of the shows. Seemed to me the recordings of the successful guests on the show talking about how they had done it would be incredibly valuable. After appearing on the show, the guests would be available to listeners at the next IDEA Cafe meeting, where they would briefly retell their story and brainstorm with us. What I discovered was that the story on the record as the guests were recorded was far different from the story they told in the closed, confidential IDEA Cafe Meeting. Dr. Amar Bhide tells me he experiences much the same thing. Successful entrepreneurs who he invites to talk with his entrepreneurship classes almost always start off giving advice, telling what the students should do, market research, careful planning, etc. When Bhide asks if that's what they did as they actually started, they uniformly say, "no, it's not what I did, but I would have been much better off doing it that way." The letter kills, but the spirit brings life. That's why I don't record what IDEA Cafe speakers share. That's also the reason I don't write Travels with Janet. 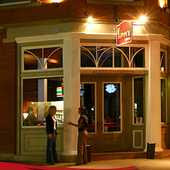 Mary and I attended the Front Range Bloggers meeting last night at the Uptown Tavern on 17th here in Denver. The 30 or so of us who attended shared what we are doing online, exchanged information about host sites, software, and who was actually making money. The pending legislation about charging Colorado sales tax for online transactions was also discussed. I expect details will be posted today on the above Facebook group, given the nature of the group! It was a bit paradoxical to be sitting together face-to-face talking about how to connect with people online. I distributed a printout of the front page of this site and http://www.COCaucus.org to the group and asked for their feedback. We joined the Bloggers after attending John Henderson's Active Minds lecture about Benjamin Frankli n (click here for notes). It was a very lively hour, I was sorry we couldn't stay for the discussion. John said very little about Franklin's Junto group, which was too bad since it played such a vitally important part in Franklin's life. Franklin's personal exercise of following a set of 13 virtues was said to be a Junto-wide activity, which wasn't the case. John let me put out Franklin Circle business cards along side his handouts, it will be interesting to see if any of those who attended contact me. "Failing and Flying" by Jack Gilbert, from Refusing Heaven. Alfred A. Knopf, 2005 . Within just a few days in November, 1979: my dad died from cancer far too young, he denied the fact he was dying until his final breath; Fr. Dave Wilson at Christ Episcopal Church who had confirmed me, baptized my children and was my spiritual adviser moved from Denver; and a therapist I'd seen once a week or more for over 3 years left town. The only one to offer final advice was the therapist: "Count it all as victory." Easier said than done. Especially for Icarus when the wax melted when he flew too close to the sun, the gods punishment for being prideful. Ten years later Janet and I separated and finally divorced. We'd married when we were just 20, me an immature 20 year old boy more concerned with sports than school, dreaming of playing pro football and then coaching. Today is the birthday of Samuel Pepys, born in London (1633), who on New Year's Day 350 years ago — in 1660 — made a resolution to keep a diary, which I read in an English Literature class after I was married and finishing a BA at the University of Denver. Until then I'd planned on being an English teacher and high-school coach if the pro-football dream didn' t work out. Now I sit each morning and watch the sky brighten the mountains and Invesco Field to the west of my apartment. It's hard to not wonder what might have been. It would be better I'm sure to count it all as victory, but some mornings that is very hard to do. Would Pepys be a blogger today? I doubt it. He wrote in code. "We come to not regret the past nor wish to close the door on it. We see where our experience can be capitalized to help other people." That's the dream now.